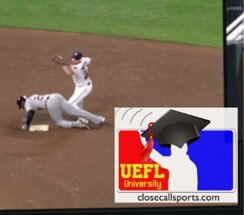 Today's Tmac's Teachable Moments audio-visual episode concerns Replay Review and a slide rule non-interference play deemed non-reviewable. We revisit our 2017 proposal, "Let's Fix Replay," and analyze the new normal of baseball in the expanded replay review era—calling a runner out for momentarily breaking contact with a base by a fraction of an inch. This slide was deemed not reviewable. First, we visit Minnesota for a standard runner-on-first and less-than-two out situation with a ground ball hit up the middle to the shortstop, who flips to the second baseman as the runner from first base slides into, and beyond, the base. The second baseman sustains the contact, and, in doing so, is unable or otherwise fails to throw the ball to first base. 2B Umpire Hunter Wendelstedt declares the runner out at second, but declines to rule interference on the slide. From our vantage point, this is a roll block-looking slide. Its severity might not be intentional—spikes caught in the dirt, etc.—but the effect is the same, with the runner appearing to roll, sideways, into the middle infielder, who in turn fails to complete a throw to first base. Although Twins Manager Paul Molitor requests a review, the play comes back as unreviewable because the second baseman failed to complete an attempt to throw to first base (the precise language in the MLB Umpire Manual interpreting slide interference rule 6.01(j) is "In order to be considered an attempted double play, umpires should look for actions by the fielder associated with making a throw toward the next play...the fielder does not need to throw the ball for the umpire to call a violation of the rule, but he needs to demonstrate the intent to make a throw"). Yikes. This brings us to point number two: Let's Fix Replay. Related Post: Tmac's Teachable Moments - Let's Fix Replay (1/19/17). U2 Blakney indicates the runner is off the base. Though the related post from 2017 is far more detailed, here are the nuts and bolts of it: mic the crew chief or otherwise clearly communicate replay decisions, require the managers to challenge immediately rather than this "hold" and "clubhouse review" phase of a 30-second delay, give the manager a beanbag and put a stricter time limit on said bag, expand the scope of replay, and limit replay review duration. 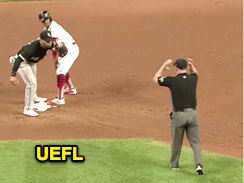 Finally, we visit Cleveland to see 2B Umpire Ryan Blakney officiating to the modern era of replay: Baserunner Francisco Lindor appears to slide safely into second base on a stolen base attempt, but Blakney stays with the play and calls Lindor out for briefly breaking contact with the base as the tag is maintained. In a game or league, such as MLB, with video replay, this is a fantastic call because it plays to the video evidence. In that sense, the call is right. In a league without replay, watch out. Though oversliding remains a concern at all levels of baseball, the "he's off the bag by one inch" argument may not be as easy to make in a non-video level of ball. In that case, we talk about getting the "play" correct as opposed to the "call." We've heard the phrase "expected call" before, and this isn't an instruction to explicitly officiate to the expected call nor to officiate to the video-supported "one inch margin" call—this is about reading the play and effecting a call that fits the game. By all means, if it's clear that the runner overslid and is out, then bang it as such, but don't guess or assume—this isn't a crew-saver call and doesn't need any overstepping. Be patient, see the entire play, and call it. Alternate Link: Tmac's Teachable Moments - Slide Review and Replay Too (UEFL).